Belying predictions of exit polls, the party won convincingly in Chattisgarh, less so in Rajasthan, and scraped through with a wafer-thin lead in Madhya Pradesh. With numbers in place to form governments in Rajasthan, Madhya Pradesh and Chhattisgarh, the elected Congress MLAs on Wednesday authorised the party's national president Rahul Gandhi to decide the chief ministers as senior leaders including top contenders held hectic parleys through the day and till late in night. As suspense mounted on who would get the top job in the three states, party leaders said the names could now be announced on Thursday after Gandhi meets the observers appointed for the three states and other senior leaders. Gandhi, on the other hand, has also reached out directly to the party workers in the three states to know their top choice for the chief minister post through an internal mobile messaging app, party leaders said. Among other two states that also went to polls, K Chandrashekar Rao would be sworn in as Chief Minister on Thursday with his party, Telangana Rashtra Samithi, storming back to power for the second consecutive term and with a bigger mandate. In Mizoram, where Mizo National Front has trounced Congress to wrest power of the hill state, the party president Zoramthanga would be sworn in as chief minister on Saturday. After a late night meeting, Pilot told waiting reporters that the process of getting the feedback was almost complete and the party high-command would take the final decision on Thursday. He did not give any direct reply to a pointed question on whether he was ready to take the responsibility, saying "Let's see, what happens". The legislature party meeting in Jaipur lasted for almost seven hours. 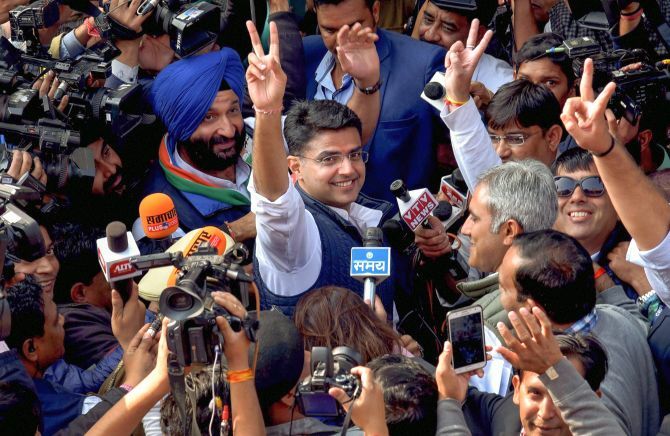 The Congress emerged as the single-largest party in Rajasthan in Tuesday’s vote count, winning 99 seats. It’s ally Rashtriya Lok Dal won one seat for a total of 100 seats -- the required number to form government. The BJP got 73 seats, and the Bahujan Samaj Party won 6 seats. BSP leader Mayawati on Wednesday pledged support for the Congress. The Communist Party of India-Marxist got two seats, Independents won 13 and other parties got 6, according to the state Election Commission. 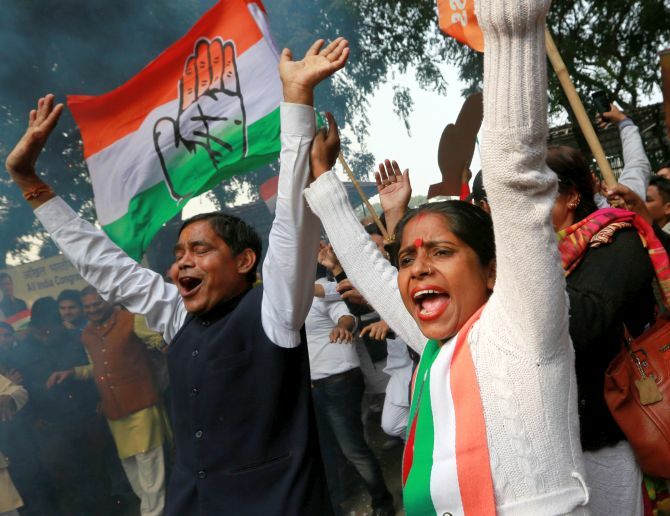 After a see-saw battle on Tuesday, Congress emerged as the single largest party in Madhya Pradesh with 114 seats, two short of a simple majority. The BJP, which had ruled the state for 15 years, got 109 seats. 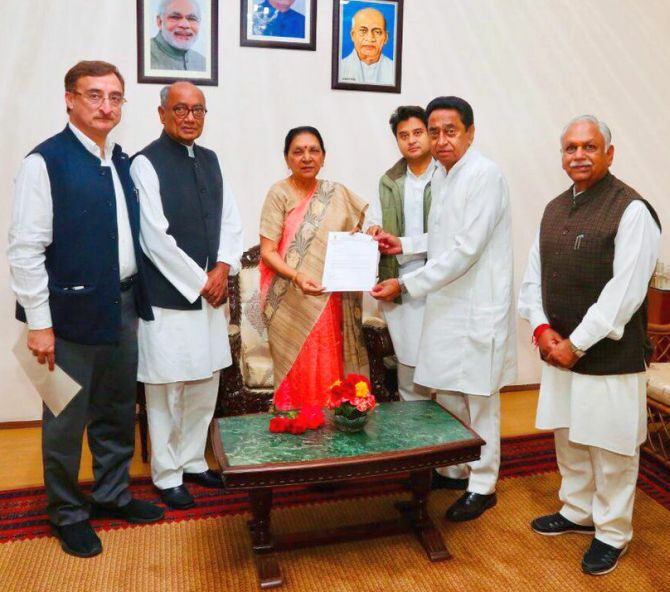 Three-time Chief Minister Shivraj Singh Chouhhan tendered his resignation to Governor Anandiben Patel. The Congress team met the governor to stake government claim with its two top contenders for the top job -- Kamal Nath and Jyotiraditya Scindia. Scindia also later told reporters that a final decision was expected Thursday. Mayawati and Samajwadi Party chief Akhilesh Yadav announced their parties’ support to the Congress in Madhya Pradesh. BSP got two and SP one seat in the MP assembly polls. The Congress has also claimed support of the four independents, all Congress rebels, who emerged victorious. 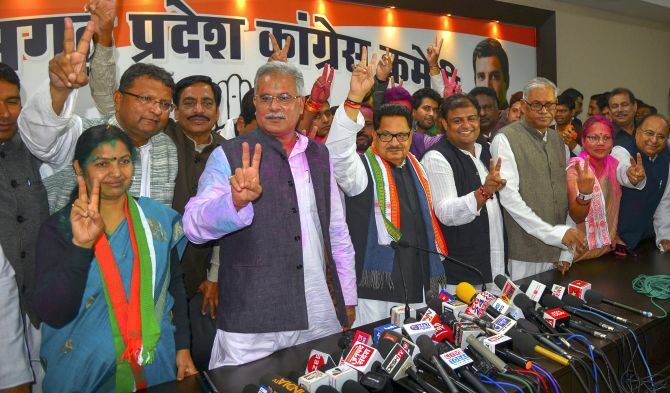 In Chattisgarh, the contenders for the CM post are Lok Sabha member Tamradhwaj Sahu, who successfully contested the assembly election from Durg Rural seat, state party chief Bhupesh Baghel and senior leader T S Singhdeo. The Congress victory in Chhattisgarh ended the 15-year rule of the Raman Singh-led Bharatiya Janata Party government. It won 68 seats in the 90-member assembly, while the BJP got only 15 seats. A party needs to win 46 seats to form government in the state. The top leaders from the three states, as also the central observers, are expected to meet Gandhi on Thursday, while hectic lobbying was expected to continue through the night on Wednesday. Central observers A K Antony for Madhya Pradesh and K C Venugopal for Rajasthan took the opinion of newly-elected MLAs, party leaders said. Senior party leaders in the national capital said the meetings of MLAs and authorising the party chief is part of an established process within the party for selecting the chief ministers. In Mumbai, Nationalist Congress Party chief Sharad Pawar said the assembly election results mark the “beginning of a change” and a “rejection” of the BJP-led government’s policies. 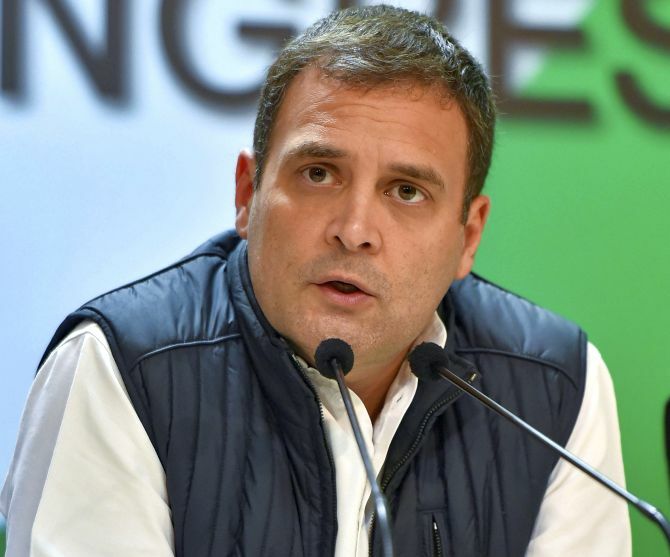 Referring to the constant criticism of Rahul Gandhi by the BJP, the former Union minister said people did not like the Congress president being “ridiculed”. “People have expressed disappointment against the Modi government... the Assembly poll results mark the beginning of a change... people rejected the anti-farmers, anti-traders policies of Modi,” Pawar told reporters. In an editorial in the party mouthpiece ‘Saamana’, the party alleged that the country was being run according to the “whims” of four-five businessmen, and this was “breaking” important institutions like the Reserve Bank of India. The BJP first “drove away” allies and later lost important states, it said, adding that elections cannot be won merely on the back of big talks. “The results clearly show that Prime Minister Narendra Modi and (BJP president) Amit Shah’s dream of making the country Congress-mukt has gone to the dust in BJP’s own regime. People of these states have indicated at a ‘BJP-mukt’ regime,” the Marathi publication said.